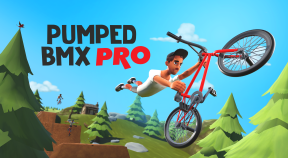 Pumped BMX Pro is the next installment in the high adrenaline, fast-paced arcade BMX trickathon. Master 60 levels and over 200 challenges while pulling off as many radical stunts as possible on one of 15 bikes. Want to make it your own? Design your own bike and hit the grind to reach the peaks of global leaderboards.